PINOYMONEYVANTAGE | Personal Finance in the Philippines: Why Kill the Electric Car? Why Kill the Electric Car? As oil's skyrocketing price of US $150 per dollar with expectation of US$ 200 dollars per dollar in a few months to come. This trend sure hurts the end user / consumers pockets as inflation rate rose a notch higher from the previous months as cost for production of basic commodities are again at all time high. In my mind, these questions struck me. So you are spending a lot of money on gas and have started thinking of ways to reduce your gas bills? Or, you want to save the environment for our future generations from harmful carbon dioxide emissions? Recently I was able to watch this video documentary made two years ago by Sony Pictures about the lessons learned on the lost of this great technology made, developed and mass produced by General Motors's - The Electric Car or EV1 model in 1996. Going back to memory lane, I was fascinated with this technology back in the mid to late 1990s when Discovery Channel was still showing the "Beyond 2000" TV program plus its advertisement on the electric car that recharges its batteries using solar power recharging station or even in the luxury of their own home using 110 voltage of electricity. It is tragic to see the loss of this technology when General Motors, Inc. (GM) pulled the plug on its EV1 project and scrapped out the remaining fleet to the leasee of these cars. The Honda and Toyota followed suit when they scrapped their SUV, pick up trucks and station wagon with EV1 technology for their gas powered , internal combustion engine cars. It is amazing on seeing a few Filipinos innovators come up with the idea of reviving this lost technology. I got a glimpse of Gerry Caroro's GCar ( www.gcarmotors.com). You can view and test ride the car at Quezon Memorial Circle in Quezon City for P 30.00 per lap. I wish they could mass produce more of these cars but would generally wait for test result and road worthiness of these cars into the public roads for the future use of the general public. 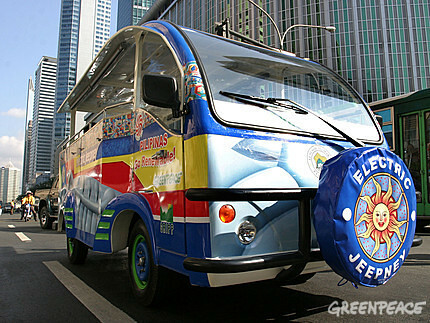 Last year, Makati City government, GRIPP (Green Renewable Independent Power Producer), and Greenpeace launched its first electric jeepney for use as public transport. They are in for one year of test piloting their assigned routes. The e-jeepneys became successful have started operating last July 1, 2008. The e-jeepneys are locally manufactured by Motor Vehicle Parts Manufacturers Association of the Philippines - MVPMAP. Salcedo Village – from Dela Costa St. turn right to Makati Ave., right to Paseo De Roxas, right to Villar St., left to Leviste St, left to Rufino St., right to Ayala Ave. and right to Dela Costa St. In other parts of the country, a Dumaguete-based startup company called Insular Technologies (www.insulartechnologies.com) assembled its own version of electric vehicle with the help of Greenpeace International. The company was co-founded by Rene Tuballa. It first debut during the founding anniversary of Siliman University on August 27, 2007. We need these zero emission, no pollution technology in this hard times as fuel prices are getting higher everyday, we need to save mother earth which we are slowly killing through global warming. How I wish that the innovations made by our Filipino scientists would not turn into obscurity as a museum pieces because we need these alternative technology now.